The following "History of Normalair" is reproduced from the 1962 Yeovil Guide. In 1941, the first cabin pressure control equipment for aircraft in this country was designed by Westland aircraft Ltd. In 1946, Normalair Ltd. Was formed as a subsidiary company to meet the growing demands for this specialist equipment, and today employs 1,100 people and has its own extensive production facilities. Normalair operate the most extensive respiratory laboratory, and are the largest producers of aircraft pressurisation, air conditioning and oxygen breathing equipment, in Europe. The laboratory has several large altitude test chambers, operated by a 4,000hp diesel and electric powerhouse, driving exhaust pumps and air compressors which can simulate the intense cold and absence of air found at extreme altitudes, and the air flows required for pressurisation in large and small aircraft. The latest chamber can also reproduce the tremendous temperatures built up by supersonic flight, so that the company can carry out the development and test of the cooling equipment necessary for aircraft and missiles. 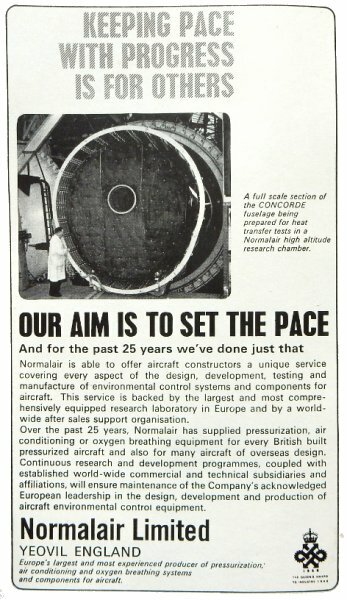 All British military aircraft that are pressurised are fitted with Normalair equipment, and such famous airliners as the Viscount, Britannia and Comet are equipped by Normalair. With subsidiary companies in Canada and Australia, and with representatives and agencies all over the world, Normalair provides a very wide market with cabin pressure controllers, discharge valves, safety valves, humidifiers, water extractors, flow control valves, cooling turbines, oxygen regulators, liquid oxygen converters, and many items of equipment vital to the needs of the aircraft of today. For several years the company has had license agreements with the two American companies foremost in these fields, namely the Garratt Corporation of Los Angeles and Bendix Aviation of New York. These agreements have been the source of substantial dollar export business by Normalair. In 1953, Normalair provided the oxygen equipment that enabled Sir Edmund Hillary and Sherpa Tensing to be the first to conquer Everest and, in 1955, provided the oxygen sets that were used in the first successful assault on Mount Kanchenjunga. These events were the more interesting in view of the parent company's achievement in 1933, when three Westland-Houston aircraft became the first to fly over Everest. The company also produces lightweight portable oxygen equipment for medical, industrial and emergency use, and are the sales agents in the UK for the respirators and breathing equipment made by Mrs Dräger of Lubeck. This business is handled by Normalair's branch office in Manchester. The company won a Queens Award to Industry for Export in 1966 and the Garrett Corporation took a 48% shareholding in the company, which was subsequently renamed Normalair-Garrett Limited (NGL). At this time the company had more than 1,300 employees. NGL took over one of its main competitors, Teddington Aircraft Controls, in 1971. In the same year the company also acquired Aircraft Supplies Limited of Bournemouth, whose premises were used to set up NGL's important product support activities. Diversification continued with the purchase of Facet Enterprises filtration licenses from Voles in 1976. In the same year Normalair’s filtration division was formed in the former glove making factory at Shepton Beauchamp facility, where it remained for 10 years before being moved to the Lynx Trading Estate in Yeovil near to the main plant. In 1977 NGL began development of its first in-house designed aircraft data recorder, a sealed maintenance recorder for the McDonnell Douglas (now Boeing) F/A-18 Hornet A/B. A data recorder that had to meet unprecedented environmental and accuracy specifications and was Normalair’s first order for US defence equipment. The F/A-18 unit placed Normalair at the forefront of aircraft recorder technology and a dedicated electronics division was set up at Clarence Street, near to the former Huish football ground. The company is now Honeywell Normalair Garrett Ltd.
Normalair Ltd's advertisement in the 1967 Yeovil Guide.